This page contains a translation into English of the lyrics to the hit song "Ya Ia'Youn Aalbi," often spelled as "Ouyoun Aalbi", which was sung by Najwa Karam. Her name is often spelled as "Nagwa Karam" by Egyptians. Also included is a transliteration of the Arabic lyrics into the Roman alphabet so you can sing along if you like. 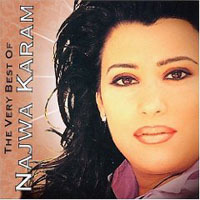 Najwa Karam was born February 26, 1966 in Zahle, Lebanon, with three brothers and a sister. Her career was launched in 1985 when she won a gold medal on the Layali Loubnan television program. 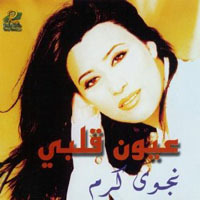 Her first hit, which led to her popularity in the Arab world, was "Ma Bessmahlak". Her favorite singers are Fairuz, Wadih Al Safi, Oum Kalthoum, and Abdel Halim Hafez. This was the most popular song in the Middle East for about two weeks in May of 2000. Ya ia'youn aalbi, ia'youn aalbi. Keif baddi naam. Lamhait basar, hal-a'omr, will bey-hibb maa ibyinlaam. Oh my heart's eyes, heart's eyes. How I can sleep? This life is a glance, and the one who loves can not be blamed. Halka-awn saar isgheer. Ibni, habeebi, iyteer a'ala a'alam taani, iykoun koullou gharaam. The universe became small. My child, my darling, fly away to another life. Life, all of it full of love. Asl ilgharaam nazrah, nazrah hanoonaih. Koul ma iltaaoo marrah ia'yoonak bia'yooni. The love is based on affectionate look. Whenever my eyes and yours meet. Aalbi beyseer jamra min naar ijnooni. My heart becomes a charcoal from my mad fire. Halka-awn saar isgheer. Khidni habeebi, inteer. A'ala a'alam taani, iykoun koullou gharaam. The universe became small. Take me my darling, fly away to another life. Life, all of it full of love. Omr il-insaan yama maktoub a'a ijbee-know. Mosh bil-iyaam ibyin-aas wala ibtool isnee-know. The life of a human being is written on his forehead. It can not be measured by days and not even by how long the years are. Omr il-insaan yama maktoub a'a ijbee-know. Mosh bil-iyaam ibyin-aas wala ibtool isnee-know. The life of a humanbeing is written on his forehead. It can not be measured by days and not even by how long the years are. Willi ma beydoub ihsaas, Ya rabbi ita'iknow. And the one who can not melt by feelings, God help him. Halka-awn saar isgheer. Khidni, Khidni inteer. A'ala a'alam taani, iykoun koullou gharaam. The universe became small. Take me my darling, fly away to another life. Life, all of it full of love.